Normally, inflation is one of the most harmful taxes, but these days inflation may do less harm than good. During most of our lifetimes, the prices of things we buy have generally increased over time. We can name some exceptions, but most items (even houses) have prices that are higher now than they were 10, 20 or 30 years ago. This general increase in consumer prices is called inflation. The Federal Reserve is charged with limiting the rate of inflation, which it can do over the long run by limiting the supply of money and similar assets in the hands of the public. Inflation is widely disliked. A number of economists think that inflation’s bad reputation is undeserved, and that, while people complain that inflation makes things more expensive, they fail to recognize that inflation also raises their wages. The net result of inflation could be to increase wages and prices in the same proportion, without harming consumer’s purchasing power. A person on a fixed income, such as a pensioner receiving a specific number of dollars a month – a so-called “defined benefit” pension – does have less purchasing power when prices rise. However, Social Security benefits automatically increase with wages in the economy, and thereby automatically increase with inflation in the long run. And these days defined-benefit pensions are less common than they used to be (and even many defined-benefit pensions were adjusted for inflation on an ad-hoc basis). We also have to remember that for everyone receiving a payment specified in dollars, there’s someone else making those payments. For example, a worker with a fixed mortgage payment sees that payment decline as a share of his income as inflation pushes up his wages. For this reason, inflation is said to favor debtors and harm creditors. The government is a major debtor, and some people suggest that sudden inflation would relieve the government’s debt burden and permit the government to spend more (prolonged inflation would just require the government to pay higher interest rates on its debt). More government spending is bad news for those who want the government to spend less, and good news for those who want the government to spend more. In any case, my research suggests that inflation is not associated with more government spending. Even if our government had no debt, inflation would increase tax revenue. Ronald Reagan famously complained about “bracket creep”: the personal income tax was not automatically indexed to inflation, so taxpayers moved into higher tax brackets as inflation raised their incomes, even though the extra income was barely enough to keep up with rising prices. Much of the personal income tax is now indexed to inflation. But interest and capital gains are not indexed (neither are some provisions of the corporate income-tax code), so inflation increases the tax burden on saving and investment. Consider, for example, a zero-inflation economy in which homes and business normally sell for what the seller paid when he originally purchased the property. According to our tax laws, those sellers would owe no capital gains tax. In a 10 percent-inflation-rate economy, assets would appreciate in dollar terms at about 10 percent a year, even though their inflation-adjusted values were constant. When the assets were sold, their accumulated value, including that annual 10 percent gain, would be taxed. With saving being less profitable thanks to inflation’s back-door income tax hike, people will save and invest less. Inflation’s harm to capital accumulation reduces productivity, and ultimately the inflation-adjusted wages workers receive. Martin Feldstein of Harvard has stressed that America’s capital accumulation was the major loser from 1970s inflation. Without offsetting Congressional action to revise the tax laws, inflation today would increase the tax burden on capital, and that by itself would reduce investment. But what’s different today from the 1970s is how mortgage debtor troubles – foreclosures of underwater mortgages and the harmful economic activity surrounding them – have reduced gross domestic product and living standards. At this point, an inflation that harmed banks and helped homeowners might be an overall improvement. The Treasury says that we must not only send it money in the present but, but raising the debt ceiling, promise to continuing send it money in the future (government debt is a taxpayer promise to pay in the future), or else utter disaster. Who Cares About the Fed? Short-term interest rates have an obvious effect on the housing market, but not the rest of the economy. Federal Reserve policy affects short-term interest rates, bank regulation and eventually inflation. I will write about inflation next week, and my fellow Economix blogger Simon Johnson has written much about bank regulation, so today I focus on short-term interest rates. The Federal Reserve, especially its New York branch, is actively engaged in buying and selling Treasury securities, and it lends money to banks on an overnight basis. As a result, it is widely thought that the Federal Reserve is an important determinant of the rate of interest paid on short-term Treasury securities. By raising the supply of Treasury securities and reducing overnight lending, so-called “tight” monetary policy raises short-term interest rates. High short-term interest rates are said to discourage borrowing, and thereby curtail private sector investment projects. The idea is that private sector projects are undertaken only when their expected return exceeds the cost of borrowing. In theory, high short-term interest rates result in relatively few capital projects, with high expected returns, and low short-term rates result in more capital projects, including those with lower expected returns. But the effect of high short-term interest rates on Main Street’s economy has been exaggerated. Although it is commonly assumed that today’s rock-bottom rates should help strengthen a business recovery, it appears that business conditions actually have little to do with short-term money markets. Many important private sector investment projects are relatively long term — it most likely takes a year or more for a project to be completed and deliver a positive cash flow to investors. As a result, many capital projects are financed through long-term borrowing, with equity financing, or out of corporate retained earnings, rather than borrowing in the short-term market where the Fed’s fingerprints are so obvious. In theory, long-term interest rates could rise as the Fed tightens the short-term money market, because some savers would be on the margin of saving in either the short- or long-term markets. Equity capital markets and retained earnings could, in theory, also be subject to similar indirect effects. Thus, the effects of Federal Reserve interest-rate policy on investment are indirect, and it is an empirical question as to whether the expected effects — tight money discourages investment projects — are significantly reflected in preventing capital projects with low expected returns. Luke Threinen and I have measured national average profitability of capital projects from the national accounts by dividing total interest and profits in the economy during a year by the total capital stock in place at the beginning of the year. In doing so, we have distinguished residential capital (i.e., houses) from business capital. Capital produces value over a number of years. In the case of housing capital, the value is in the form of shelter and the convenience of a home. For any piece of capital, profitability (capital’s marginal product, as economists call it) can be calculated as the dollar value it creates during a year — after subtracting depreciation, costs of labor, maintenance and intermediate goods — per dollar invested. Owners of capital prefer their capital to be more profitable, rather than less. It’s the profitability of capital (after taxes and subsidies; more on those below) that makes an owner willing to purchase capital in the first place. 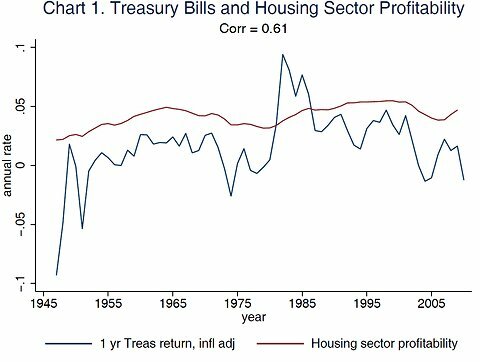 Chart 1 compares the profitability of housing capital to the inflation-adjusted return on one-year Treasury bills (for comparability with T-bills, housing profitability is adjusted for property taxes). Consistent with the view that tight monetary policy both raises Treasury bill rates and reduces housing investment, the two series are positively correlated. The home-mortgage market appears closely linked, so high Treasury bill rates cause banks to charge more for home mortgage loans, which discourages homeowners and landlords from building homes unless the demand for homes is sufficient (i.e., landlords can earn enough rent from their tenants to cover a high mortgage rate). Among other factors, easy credit from the Federal Reserve in the early and mid-2000s made it easy to buy and build homes, and as the inventory of homes grew the amount of rent that each home could earn (many homes went vacant, for example) fell, which shows up in Chart 1 as especially low values for the red series. In this way, the housing cycle of the 2000s confirms the usual story about how monetary policy can affect housing investment. The usual story about Federal Reserve policy and business investment says that a similar process works on the business sector: High Treasury bill rates cause banks to charge more for business loans, which discourages business from investing unless demand for their product is sufficient (i.e., businesses can earn enough profit from their operations to cover a high loan rate). Our findings for the business sector are quite different from the usual story. 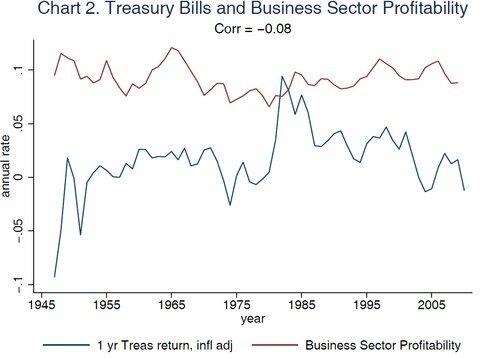 Chart 2 compares the profitability of business capital to the inflation-adjusted return on Treasury bills, and the correlation is negative. One way that easy monetary policy could hurt business investment is by encouraging home-construction activity, and home construction takes resources away from business construction. The evidence in Charts 1 and 2 suggests that the housing market can be stimulated by easy monetary policy, at least in the short run. But the link between monetary policy and the business sector is much weaker, and our data are consistent with the view that, holding constant the rate of inflation and the amount of banking regulation, monetary policy does not have a discernible effect on the cost of business capital. Who Cheats on Their Taxes? The United States Treasury has taxpayer integrity to thank for many of its tax collections. But some Americans are not honest with the Internal Revenue Service. Last week I explained how many taxpayers accurately report their income to the I.R.S., despite apparently low penalties for underreporting. Many economists say that people are willing to sacrifice some disposable income in order to be honest taxpayers; others say that fear of penalties is the overwhelming motivation for tax payments. Three years ago, in his Ph.D. dissertation at the University of Chicago on “Tax Compliance and Social Values,” Oscar Vela suggested both that taxpayers are honest and that they are largely so because honesty keeps them from losing income. In other words, some people pay taxes not because of fines that the I.R.S. might levy, but because a tax conviction would harm their professional reputation and that, in turn, would lower their income. 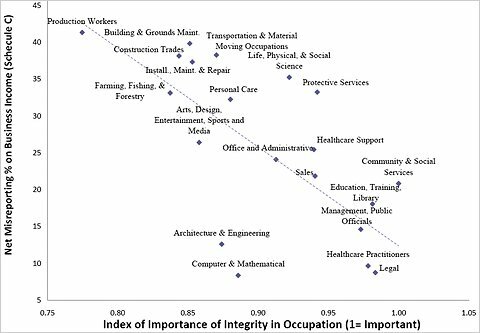 Dr. Vela looked at the importance of integrity in job performance in the Occupational Information Network and found that the occupations where integrity was especially valued coincided with the occupations where the I.R.S. found tax compliance rates to be the highest. The chart below shows some of Dr. Vela’s results, with tax compliance measured as the fraction of business income that was found by the I.R.S.’s special compliance study to be underreported. Vela Trevino, Oscar Ernesto, “Essays on the Economics of Individual Tax Compliance,” Ph.D. Dissertation, 2008.
Business income reporting has a large scope for potential underreporting, because the I.R.S. cannot as easily match third-party transaction reports to business tax returns the way it can with, say, employee W-2s. For example, the construction trades do not appear to value integrity as much as other occupations do – Dr. Vela found the occupation to be ranked third from the bottom, based on the Occupational Information Network. Construction is also one of the top occupations in terms of underreporting business income. Another finding is that the much-disparaged legal occupation is near the top in terms of valuing integrity, and that lawyers underreport a relatively small fraction of their business income. Dr. Vela also examined other times of tax cheating and other demographic factors that were correlated with it, such as education (education and tax compliance were positively correlated). He concluded that taxpayer integrity cannot be taken for granted, and that it evolves over time according to changes in a nation’s education and occupational structure. Copyright, The New York Times Company Millions of taxpayers are filling out their tax returns over the next several days. Economists are still not sure whether taxpayer honesty or fear of the Internal Revenue Service explains why taxpayers’ income reporting is pretty accurate. But with the Treasury spending more than ever, it’s important to know why people pay their taxes and what will continue to motivate them to pay in the future. It’s difficult to get exact numbers on income tax cheating, but I.R.S. studies (read about them and other tax-evasion analysis in Prof. Joel Slemrod’s paper) suggest that reporting of wages and salaries is so high that the Treasury receives 99 percent of what it would if all taxpayers were honest about that income (see Page 2 of this I.R.S. report). You might think that people pay taxes merely to stay out of trouble with the I.R.S. But 99 percent of people are not audited by the I.R.S., and even the remaining 1 percent are penalized only about 10 percent of the amount underpaid. (The I.R.S. is, however, increasing its audits of the wealthy.) From a financial point of view, underpaying taxes looks like a high expected return investment: a 99 percent chance of keeping the, say, $10,000 that you underpaid the Treasury and a 1 percent chance of having to pay the $10,000 plus a $1,000 penalty (on average, you get $9,790 for every $10,000 you hold back from the Treasury). Some economists have tried to reconcile low penalties with high compliance, arguing that people obey the tax laws for non-economic reasons – people want to be honest and pay their share. Or perhaps individuals don’t understand that any one person’s tax payment is not critical to the functioning of our government, while the aggregate of millions of tax payments are. To the extent that much of the Treasury’s revenue arrives because taxpayers are honest, public policy might not want to take honesty for granted. For example, the Treasury may receive less revenue over time if taxpayers increasingly distrust government because they perceive their tax dollars are wasted. There’s some truth to the honesty theory (I’ll write next week about a study of integrity and tax compliance), but tax compliance still responds to incentives. When the probability of audit falls, compliance falls. It’s difficult for the I.R.S. to verify many types of business income: as a result the amount of proprietor, rent and royalty income that is reported is actually less than the amount unreported. Nanny taxes -– self-employment taxes paid for household employees -– are another type of tax on which many people cheat, and enforcement on this front is weak. Though on this and other tax issues, high-profile people –- like political appointees –- should beware. Among those whose failure to pay various taxes were widely publicized were Tom Daschle, President Obama’s nominee as secretary of health and human services; Treasury Secretary Timothy Geithner, and Zoe Baird, President Clinton’s nominee for attorney general. A Ph.D. dissertation being written by Mark Phillips, a University of Chicago student (and an I.R.S. intern) argues that a reasonable fear of penalty explains much of why taxpayers pay their income tax. He agrees that I.R.S. audits are rare, but that the audits are well targeted, so the agency would quickly detect many ways that taxpayers might consider underreporting. For example, Mr. Phillips asserts that the I.R.S. would easily notice a taxpayer who reported less wage and salary income on her return than appeared on the W-2 reported by her employer to the I.R.S. Taxpayers understand this, so they are pretty careful that their return matches the W-2, and the result is that deliberate discrepancies are infrequent and frequent audits are unnecessary. For now, it looks as though both honesty and incentives help bring revenue to the Treasury.